Living Intentionally: Finally gonna go “Do something”. So, “7”, Chapter 2: Clothes. A few of Hatmaker’s reflections struck a cord, but, actually, my own thoughts struck a deeper cord. I think I need to change some things, and for some reason, clothes hit me. It didn’t hit the author, Jen Hatmaker as much, but it hit me. I have much. I have TOO much. I don’t need as much. And I want to change what we have, why we have it and where it goes. So there, I said it. I need to work on the clothes thing… It’s just a thing…a thing I like, and I have been blessed and I see this, and it is time to bless others. 5 bags of clothing later, of JUST HIS STUFF, and we are still full. Talk about excess and consumerism. I am addressing these issues in a new way. So what are we going to do with it? Well, not Goodwill. So….I shop at Goodwill. I like it. I love a bargain and love finding someone else’s near new “excessive” item, that they paid $170 for (let’s say Hudson Jeans, for instance) and I get to buy them for $24.99, or $14.99 or even $9.99 on a day when the pricing person in the back didn’t realize they are “Hudson”. Just an example…you get the picture. And then when we clean stuff out, we just drive a few blocks away (literally) and leave a bag of our excess at the donation drop off. Done. And when I drop off, I look and see the other stuff people drop off, and I am just a part of the club. Just normal thing to do…and it IS helping create jobs, etc. etc. However, I want to be more intentional. So, I cleaned the closets and choose not just give to Goodwill, or sell on eBay (I do that, too), or drop off at consignment (I do this as well) but hand to someone in need. Literally fulfill a need. This isn’t easy, let me tell you. Because not every non-profit needs exactly what we have, and the season of clothes or shoes we have. We need to sort, and organize and seasonalize (is that a word??) and decide. First, Winter clothes and jackets to Night Strike for the homeless. I haven’t gotten to blankets yet, but I am sure I will grab one to go with as I walk out the door. Second, professional women’s clothing for a company called Dress for Success for women who are trying to get on their feet, whether they were held up by domestic abuse, or poverty, etc. Third, a couple jackets for a friend collecting for a local low income school. Fourth, set aside a few bags of spring summer for the season when it might be needed and be patient and see if there is a need. The reality is, it is NOT EASIER to give to those who need directly. It is WAY EASIER and LESS PERSONAL to drop off at Goodwill. (Again, don’t get me wrong, I shop at Goodwill, and I donate to Goodwill and they provide jobs and such, I get this, but this isn’t a stretch for me, Rachel Kathleen). I have to be patient. The stuff that I have too much of, has to sit longer, and I have to work to find the right fit for these items…but I am trying to live with more personal intention. To bless others, in a hands ON approach, not a hands OFF approach. I currently have BAGS of clothes at the bottom of my stairs (see above). I want to have it cleaned up. But….I am trying to be intentional, and intentional takes time and effort. This is effort in my sheltered little world…let a mess sit a few days. Also, I don’t just intend to give that which we have worn, or decided is no longer the “style”. 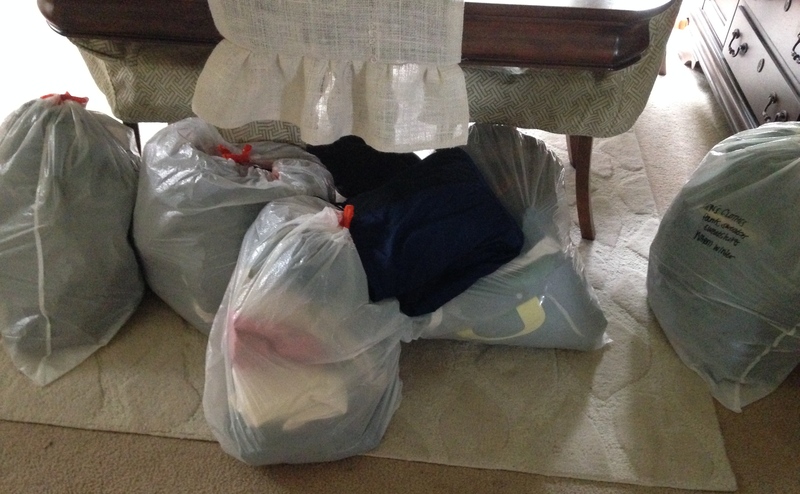 Again, this is all a work in progress – I don’t want to keep consuming so I can give my stuff away…I would like to buy less, and then be able to tithe away the extra to people who need it. But again, I am in process, and my thoughts and actions are taking in an overhaul. I want this to be a LONG term lifestyle…not a short term purge! So for now, purge on! Again, being in the wilderness and reading “7”: Another musing, processing, thought-provoking application for me. Second, I was reading while in the wilderness (funny, I had very little to distract me) and chapter 6: Spending, caught my attention. There is something to being a consumer, and we just simply need to change the way we spend our money. We have money. We are NOT rich in the eyes of our friends and neighbors, but we ALWAYS talk to our kids about how we ARE, in fact, rich in this world. We tell our kids often that we have SO much, and our house is bigger than the majority of the world. Even the boys, who share a bedroom, are blessed, because most families have an entire HOME that is the size of their room. “Yes, their homes are small, and these families layer themselves and live together- in Africa, in India, in South America…” Questions come up such as: “Why us?” and “What are we supposed to do?” That, my friends, is another blog post. We are working on it. However there is also power in where we spend our money. We can make choices to spend money in places that make a difference. I have power in my purchases and I want to make sure we are spending less money (to put aside to give away), and that I am spending money on things that can have a decent impact. Right around the corner: Christmas. 1. I want to research where I am spending and give something that has meaning. For instance, an item that would ‘give back’ to a greater cause. Like Tom’s shoes. You buy a pair, and then someone in need gets a pair. There had to be companies like this. 2. I am going to continue to refine ‘gift giving’ in our own family. There will be family reduction and other intentional applications for nuclear “us”, but I am still processing on the most meaningful ways we could express love, worship and honor to the Lord and one another…we will get there…. literally give to someone in need (buy a pair of boots, and they give a pair to a kid in Romania that wears flip-flops in the winter. This is what I have found. This is in NO WAY an exhaustive list. I have spend quite some time reading the “About us” and “Our Stories” and also looking these companies up individually. Noonday Collection: Jewelry, Scarves, Bags, women’s accessories…see link. This company has a beautiful story that I am learning more and more about. In my research I have contacted a local ambassador and asked her about the company and her own personal interest, as well as the cool things that she knows that I would not. I am going to invite others to join me in (at my home) and hope to raise money for an adoptive parent, as well as giving my dollars to women abroad who have a talent and can be paid a wage that can launch their own dream or support their own families. Krochet Kids: A cool bunch of guys, crocheted some hats, went abroad, saw a need and created a company that gives back. They have some cool guys stuff, snow boarding and skiing hats and scarves and I like the look too. Stone + Cloth: Buy a backpack or an item and it supports education in third world countries. Cool bags, and clean fresh look. Amazima: Katie Davis launched this to support women in Uganda. There is a beading circle of women and their beautiful projects are purchased fair-trade. If you haven’t read “Kisses from Katie” you SHOULD (Click on “Should” to see previous blog post). Raven and Lily: uses the Open Arms refugee, made in America mission to furnish their products, as well as local artisans and they re-invest their profit into the women’s businesses in the different countries. I love this explanation of their name “Raven and Lily”: “After contemplating the words for a company name, we knew we wanted something that would capture the beauty and dignity of the women in our partnerships. We were inspired by Luke 12, where God says that we shouldn’t worry about what we will eat or drink because He cares for the ravens and we are so much more valuable than birds. He also says to look at how beautiful the lilies are yet they are here today and gone tomorrow and how much more valuable we are than flowers. We feel that the value God sees in His creation, including ravens and lilies, reminds us how much more valuable we are as women.” Some items are on the more expensive side, but they are very high quality and are items that are in my scope of personal “taste”. I need to buy LESS. This is good stuff. Roma Boots: Partnering with World Vision, just sweetens the deal! Roma boots and World Vision give back together…Every pair of rain boots gets boots to Romanians and others in need and give to education. Cute boots (bye-bye wish list item: Trendy and cool Hunter Boots)…I love the YouTube on this. Live fashionABLE: Mostly scarves, there are specific women that make these items. I am particularly interested in the “game-day” scarf for some people in my life. Come Together Trading: These guys started this company after a Compassion International Trip…I am working with Mary and Martha who also gives to Compassion International, so that is a draw. This wouldn’t necessarily be my “go-to” as a lot of items look like an import store, HOWEVER, they have a wonderful variety, and it is a good one to have on the list for items that aren’t really represented anywhere else. Other companies that we will be giving from include companies that bring something positive and meaningful into the home of those we love. A few examples are: Mary and Martha (Loving God and Loving others), walk in love (Walk in love. is dedicated to selling well-designed, high quality products with a positive and inspiring message. That message is a reminder to imitate God by loving others every chance we get – no strings attached. We believe that Jesus came and showed us how to be that message), and anything else with an inspiring and positive reach. 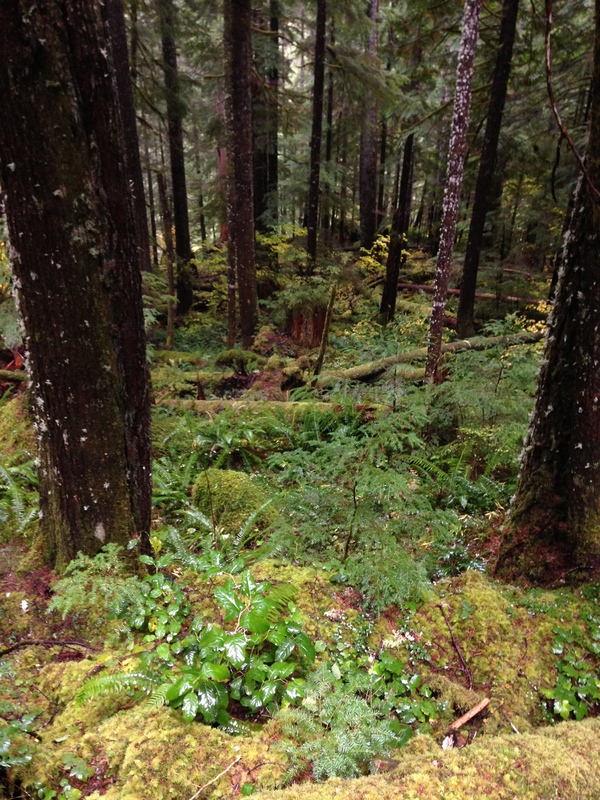 So, I recently chaperoned (49) 8th graders in the Ancient Forest (Opal Creek Ancient Forest Center). We had to hike 3 miles to get in (to the ancient forest), took no showers for 4 days, and had absolutely NO access to wifi, cell, landline phones or internet. There is a lot more, of course, but to sum it up: it was a great trip. Living in this way for 4 days gave me LOTS of room to read, think and process. I intentionally took the book “7: an experimental mutiny against excess by Jen Hatmaker. Well, that sure got me to thinking…if you haven’t read it, you SHOULD. It is funny, personal, thought provoking…honest, and again, FUNNY! These two together is a thought provoking combo…I knew it would be…but didn’t know my response or what I would be moved to change in my own life. Well. I. need. to. change. a. lot. But, I need to take it in “bite-sized” pieces. I want it ALL to change NOW…but that’s just not happenin’ as I drag others (the three, a husband and a dog) along with me! So, for MYSELF, I am going to re-join the blogging world after a summer and early fall hiatus and work through the lessons I have learned…not JUST from 4 days in the wilderness and a book, but that things that have been percolating in this little mind of mine for quite some time.